So this kind of blew my mind: Sting to write introduction to John Constantine anniversary hardcover. But nope, there it is, officially announced by DC Comics. And if you click on that first link, you’ll see an actual honest-to-goodness video of Mr. Sting speaking about the occasion, dressed like Constantine. I mean, if only that could have been our movie version of John, right? …but, man, that’s it. I admit defeat. If Sting says it that way, then, you know, that’s just how it’s going to be. MY WAR IS OVER. Never give in! Never surrender! I’m still not a hundred percent sure if this is Sting the singer or Sting the wrestler. Myron M: it must be Sting the singer because in the eccentric heading of the article it describes him as a “Global rocker” a phrase never used by anyone in reference to Sting, or anyone else, ever. String looks awesome as Constantinople! Wasn’t it based on the sinister character Sting played in the 1982 film “Brimstone and Treacle”? Gotta know when to fold em I guess. 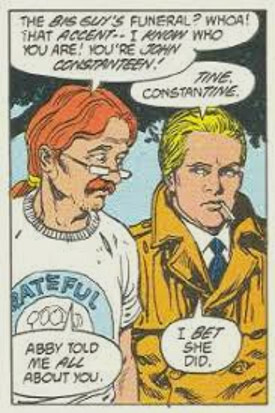 This probably never got enough circulation to become a proper urban legend, but once upon a time there was speculation that Keanu Reeves was cast in CONSTANTINE precisely to avoid legal action by Sting. The idea was that Mr. Sumner might not be aware that there was a comic book character based on him, or if he was he might not mind so long as it was something that sold only a few thousand copies to a bunch of freaks, but he would not overlook a multi-million dollar Hollywood movie. Therefore, so the reasoning went, the producers made a point of casting someone who looked and sounded nothing like Sting. I pass this along though I find it unconvincing. It would have been an unnecessary move. Say that the role had gone to Jude Law or Ewan MacGregor (names that came up often when fans were dream-casting): you would have had a character who still suggested the comic book character, but who definitely looked like Jude Law or Ewan MacGregor, not Sting. No, I have to assume that Reeves was cast for the simple reason that he was the biggest star the producers could get.